A personal record of my walk of the Ridgeway National Trail with written journal and photographs. Tracklogs for GPS units and for use with Google Earth are available for download for each stage. 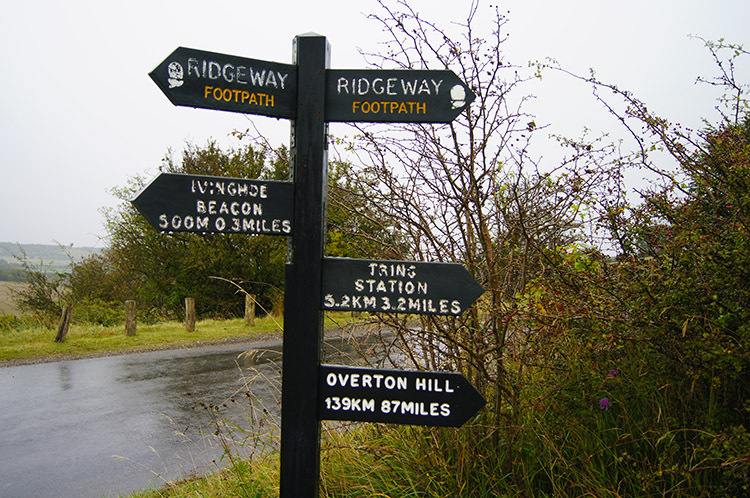 I had wanted to walk the Ridgeway National Trail for quite some time. Having walked the full length of Great Britain the year before (2011) and during that walk having completed the Cape Wrath Trail, West Highland Way, Heart of England Way, Cotswold Way and most of the West Mendip Way I was keen to do more National Trails and Long Distance Paths. I chose the Ridgeway because of the locations synonymous with the ancient history of England I would come across during the walk. 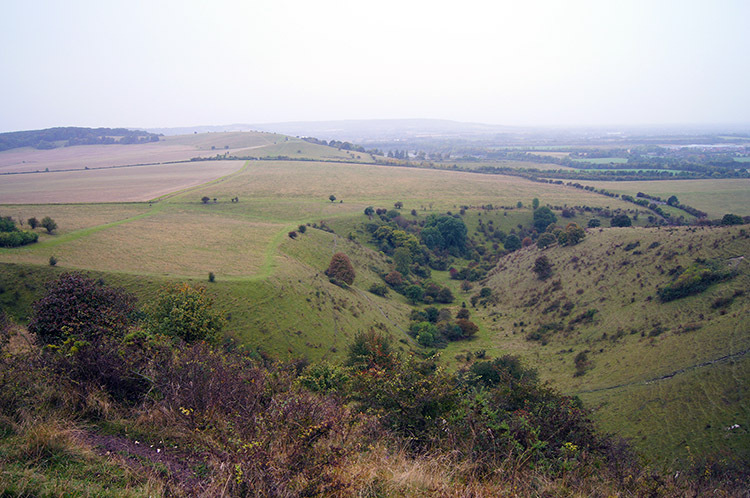 The Ridgeway is possibly England's oldest trail, or part of it at least as it follows the course of the ancient Icknield Way path from Dorset to East Anglia. Along the course of the Ridgeway there are many historic sites ranging from the Stone Age to modern times. Having arrived at the north eastern end of the trail at Ivinghoe Beacon I was keen to get going. This first stage was a short introduction to the Ridgeway as I travelled from Harrogate to Tring on the British Rail Network and then had to do most of this stage in reverse before returning from the starting point at Ivinghoe Beacon to Tring Railway Station. I then continuing on to Hastoe where I finished for the day. 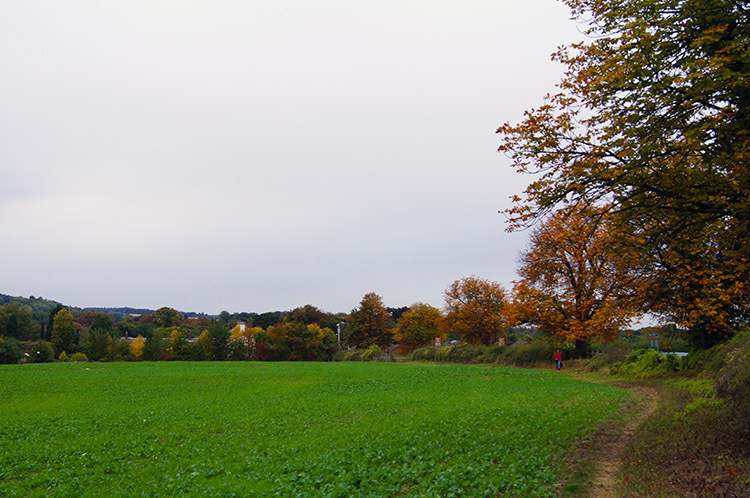 It was an overcast early October day when I began my walk along the Ridgeway. 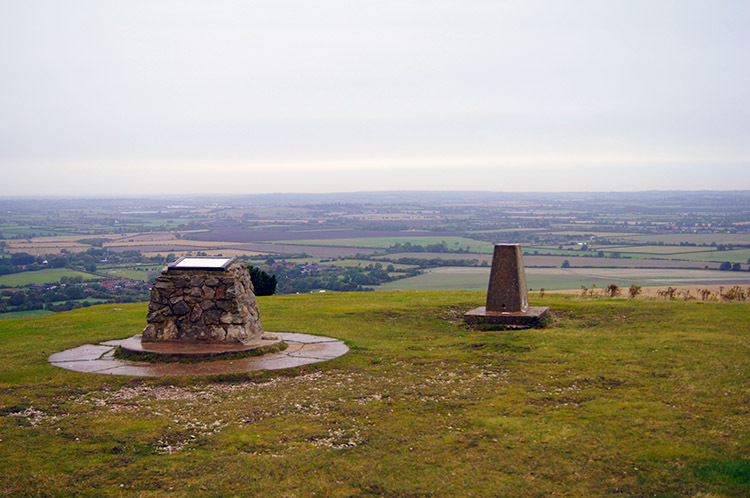 Having arrived at the foot of Ivinghoe Beacon I climbed to the top of the hill, not without a little difficulty due to the slippery conditions underfoot. Once at the summit of the small hill I took a break to look around and take in the view. Despite the low cloud and accompanying drizzle I could see quite a way into the distance. Looking north west across the flatlands of Buckinghamshire was most rewarding, a new experience. After viewing what I could of the panoramic view I turned to the south, steadily walked down the slippery slope of the hill and began my Ridgeway journey. I found the first way post helpful, distance marked in tenths of a kilometer. 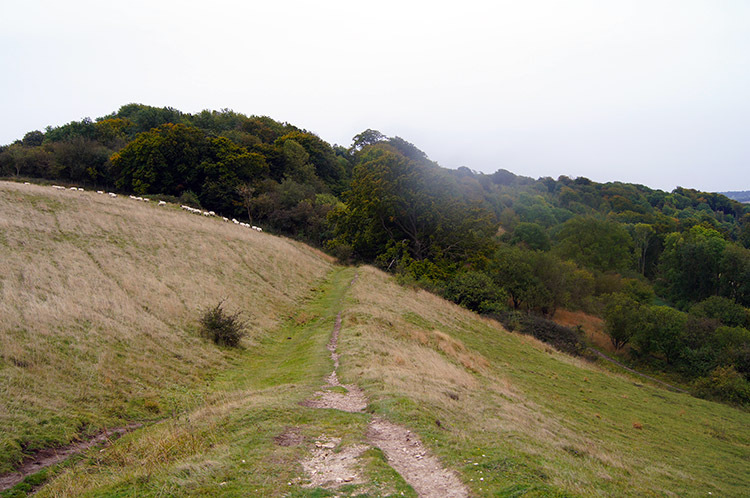 After crossing Beacon Road I climbed up Steps Hill which provided good views of the Ridgeway path south. Looking to my right I noted the cut of Incombe Hole before walking down Steps Hill to a large open field where a sign warned me not to pick anything up I might find on the ground. 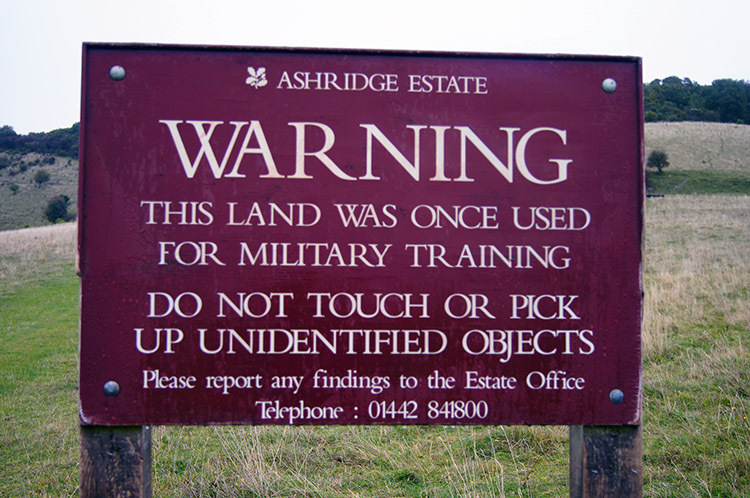 'This land was once used for military training. Do not touch or pick up unidentified objects' was a plain enough instruction to follow. Thus keeping my hands safely in my pockets I continued straight across the long field to another minor road which I crossed to follow the Ridgeway Path towards Pitstone Hill. 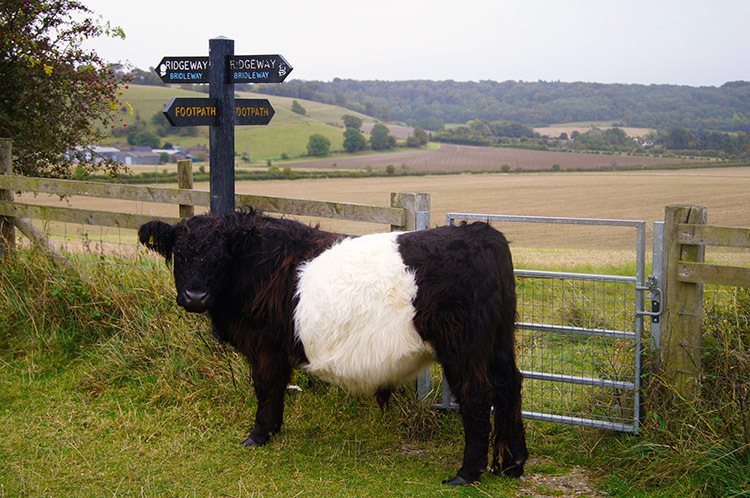 I passed a small herd of young Belted Galloways as I ascended Pitstone Hill. They were calm which pleased me as I have had trouble with this breed before. They can be aggressive. The walking so far, albeit only two miles, was lovely, up and down on gentle undulating hills much like the Yorkshire Wolds of which I was familiar. I looked back over the gentle rolling terrain to Ivinghoe Beacon for one last time on the top of Pitstone Hill before continuing on towards Albury Nowers. As I walked across Albury Nowers I looked down to the right where there was a chalk pit. 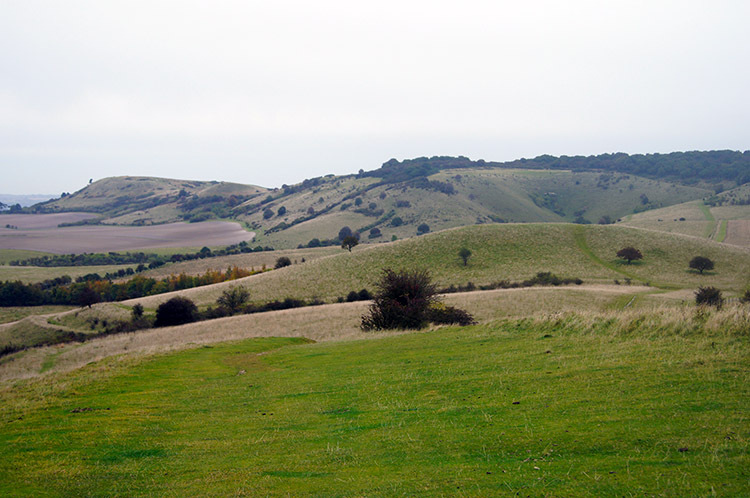 Seeing it confirmed why the terrain was much like the Yorkshire Wolds, both ranges sitting on beds of chalk. Looking at my map I noted I was walking along a stretch of path called Grim's Ditch. This was my first piece of real evidence that I was walking along an ancient trail. 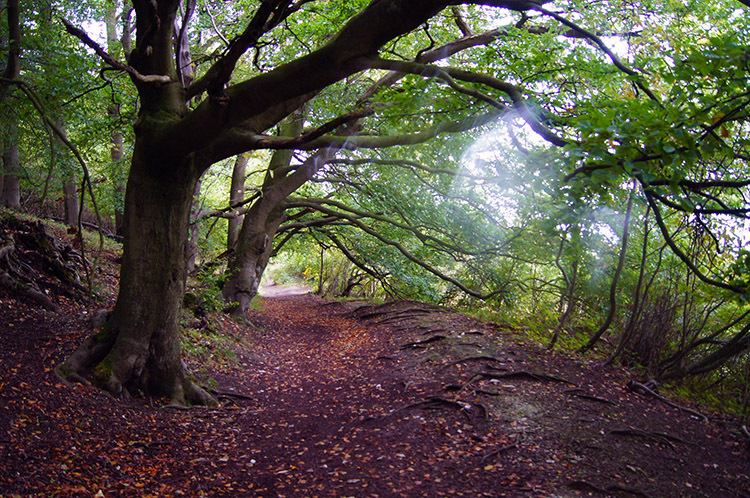 Grim's Ditch, Grim's Dyke (also Grimsdyke or Grimes Dike in derivative names) or Grim's Bank is a name shared by a number of prehistoric bank and ditch earthworks. This was not the last ancient earthwork, dated at around 300BC, which I would cross on the Ridgeway. 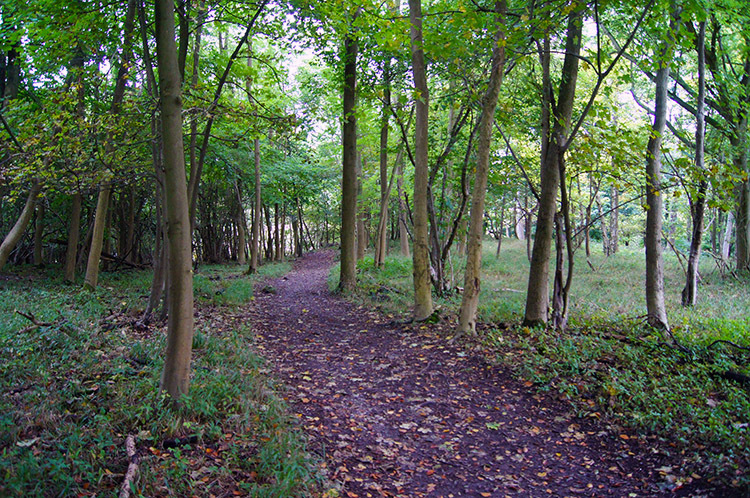 After a couple of hundred yards I left the course of the ditch by entering woodland, my first of the trail. 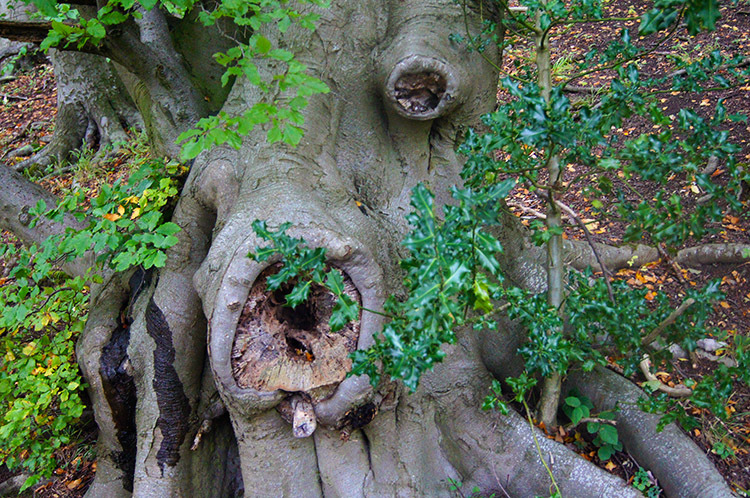 The woodland was typical English with a mix of old and young native trees including Oak, Birch, Beech and Horse Chestnut. Autumnal colours were just beginning to spread across the leaf of the trees. As usually find the Horse Chestnut were the first to begin the transition to bronze. 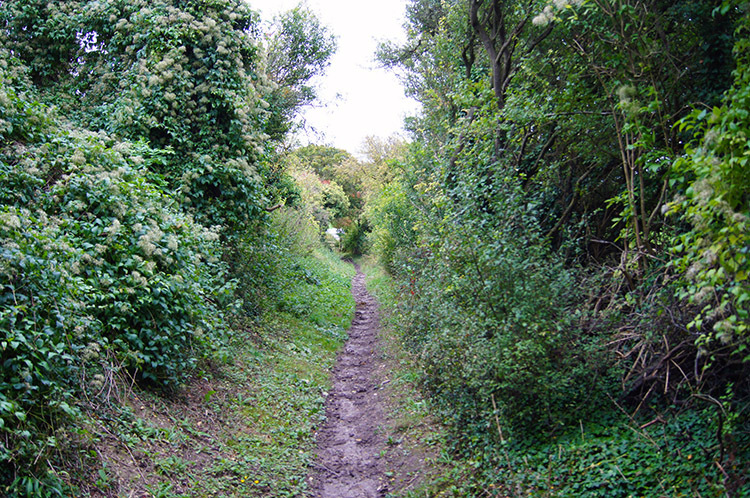 The lovely woodland path which took me on a gentle descent lasted for about 500 yards and then I continued descending along a hedgerow path towards Westland Farm. Near Westland Farm I reached my third road crossing of the walk. 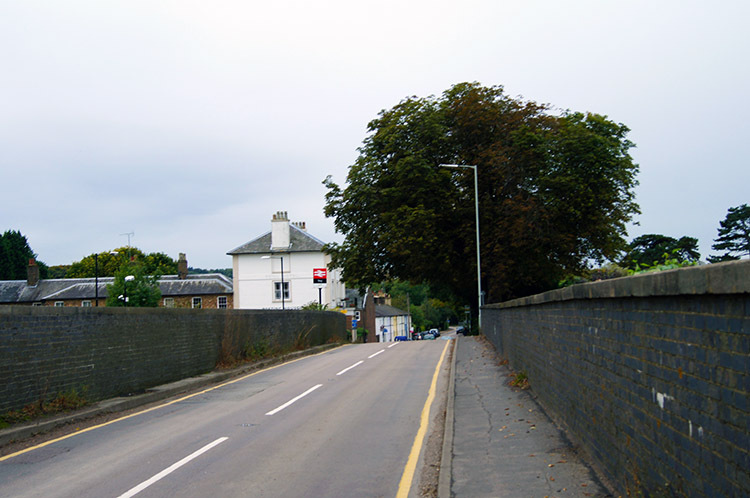 This one was Station Road linking Aldbury to Tring and the map showed I should follow it past Tring Station to a point where the road crossed the Grand Union Canal. However a kindly landowner had provided a permissive path along the side of a field which I followed. As I did so I met a walker with a dog going the other way, the first person I had met on the Ridgeway. I left the field to follow a footpath beside Station Road which took me over the railway line and then past Tring Railway Station. After a few more yards I reached a road junction and the Grand Union Canal at which point I turned to follow the road on the left hand fork for about 50 yards before leaving the road to track uphill past Chestnut Wood to the A4251. I carefully crossed the road before following a path across a small field to a footbridge which eased me over the busy A41 road. The bridge crossing was the only noisy section of my walk. Trees and thick bushes had shrouded most of the grating noise of the busy commuter road on my approach and soon after leaving the road behind and climbing gently across a couple of fields to Wiggington, passing Dunsley Farm trig point and then one more short section of field I was in peace once more, this time in the thick of Bull's Wood. I was following the Icknield Way now, rather than the Ridgeway which ran parallel a field to the south but I found the woodland a more favourable option. 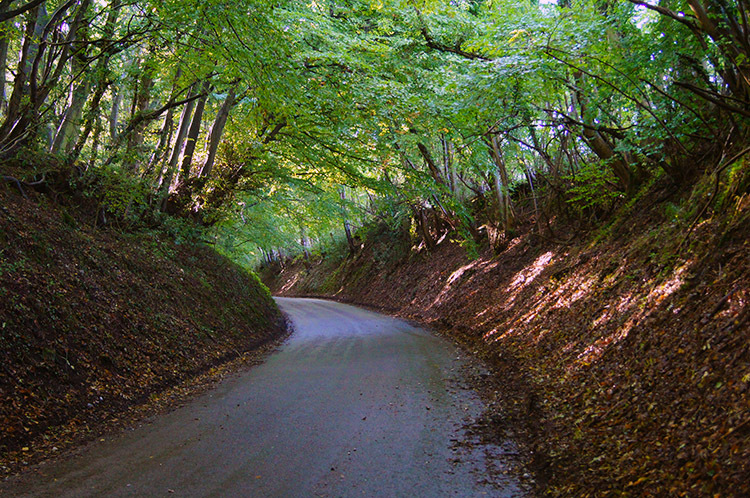 I soon met the Ridgeway again after a short stretch of Holloway road at Hastoe Cross. Here I concluded my first day on the Ridgeway. Despite the overcast conditions I had really enjoyed my first day on the Ridgeway. The start of the walk across open rolling chalk land was very pleasant and afterwards the mix of minor roads, paths, wider tracks, field crossings and lovely English woodland which changed with pleasing regularity was most enjoyable. As I ambled down into Tring where I was staying the night I smiled and looked forward to the next stage.